Watching modern freighters at dusk on the Baltic Sea while imagining the Viking longships of old. 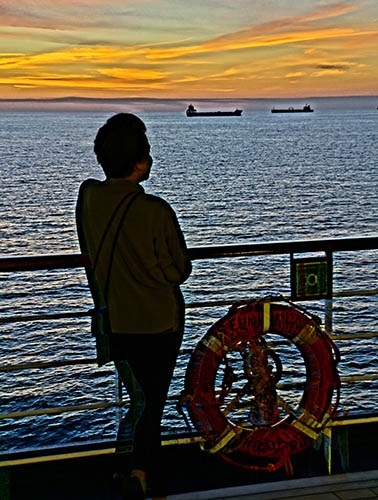 ABOARD THE EURODAM –As we voyage through the Baltic Sea on the fourth day of our cruise, it is appropriate to imagine these waters as they were sailed by those savvy mariners known as Norsemen from the eighth to twelfth centuries. 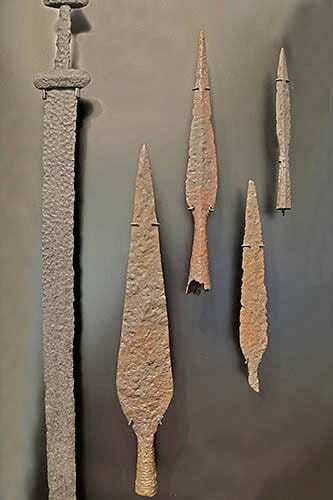 Originating from small groups scattered about what are now the Scandinavian countries of Denmark, Sweden and Norway, these intrepid explorers conquered Europe and beyond and became known as Vikings. According to a couple of theories they either were named for a person from viken, a place in the Oslo fjord, or the name was derived from vikingr, a word for pirate in Old Norse, an early Scandinavian language. From Ireland to Iceland and beyond these medieval pirates ventured forth to rule sea trade buying commodities including silk, spices, silver, wine, glass and pottery, while selling fish, leather, fur, walrus ivory, iron and tin, wool, wood, honey and wheat. 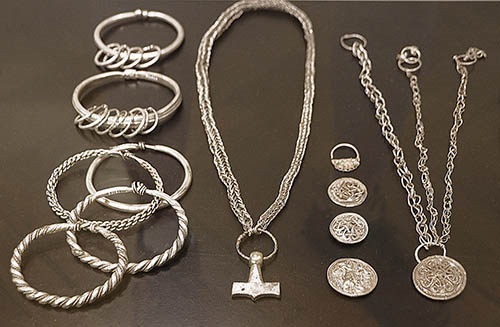 Viking silver was mostly acquired by theft and extortion. Exhibit from the National Museum.of Denmark in Copenhagen. Among the most valuable commodities the Vikings traded were slaves acquired on raiding expeditions to Eastern Europe or the British Isles, although criminals from home could also be enslaved and sold. Perhaps the most infamous example of the practice of slavery was the affinity Vikings held for the women of the British Isles. It’s not known if this soft spot compelled the Vikings to kidnap or to charm the prospective young “wives,” but genetic evidence is clear that Iceland was colonized by Viking men with brides bearing Irish and British mitochondrial DNA. 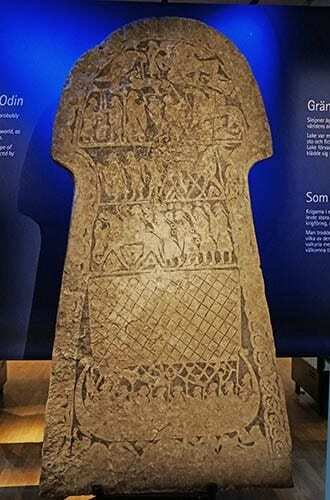 Large Viking rune stone found in Uppland province at Swedish Museum of History. In Norse society raids were a normal consequence of a growing population and their religious beliefs. While others in Europe during the Viking period were known to plunder, the Vikings were the most successful due to the superiority of their longships and the extensive range in which they conducted their raids. These seafarers sailed most of the North Atlantic, venturing far afield to the shores of what is now North America, south to North Africa, and east to Russia and the Middle East, and perhaps to as far away as Central Asia. Notoriously, they even left their mark by carving on the walls of sacred Hagia Sophia in what is now Istanbul. Model of Viking Village in miniature in Stockholm’s Museum of Swedish History. If your image of a Viking is a burly giant with unkempt blond hair and a scraggly beard with horns on his helmet, you’re probably thinking of the Minnesota Vikings mascot, Viktor. Despite extensive searches over the years, archaeologists have been unable to find any Viking helmets with horns. Neither was the average Viking man gigantic. According to historical records, they stood only about five feet seven inches tall. And while early depictions of Vikings had them with long hair and beards, by the mid Viking Age they had become quite well groomed. It was often the fashion for Viking men to use a special soap to bleach their hair making them perhaps the world’s first bleached blonds. Along the coast of the Baltic from Latvia to Finland to Sweden, the wives of Viking sailors would await their return home from a summer of exploring, trading, and looting by lighting the nighttime skies with flaming bonfires as beacons to guide the husband’s way. 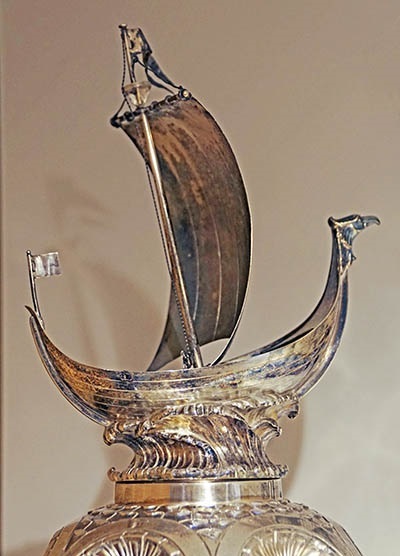 1890s silver punch cooler decorated with longboat at Nordic Museum in Stockholm illustrates historical influence of Vikings on Scandinavian culture. This tradition is now re-enacted annually – this year on August 29 – with a festival, The Night of the Ancient Bonfires. Roaring fires are maintained along the Baltic shore by festival celebrants, plentifully fueled with a liquor of 40% alcohol, known as akvavit or aquavit. This potent spirit, flavored with herbs, spices, or fruit oil, has been produced in Scandinavia since the 15th century. Tolearn more about the Vikings, there is a museum in Stockholm and two in Copenhagen that can be visited. Stockholm’s Swedish Museum of History has an extensive exhibit on the Life of the Vikings. Several rune stones and picture stones in the museum depict Viking clans in Uppland province who built splendid halls headed by wealthy aristocrats that collected possessions from many far away foreign lands. Women are also documented as wealthy leaders, sorcerers and fortunetellers. 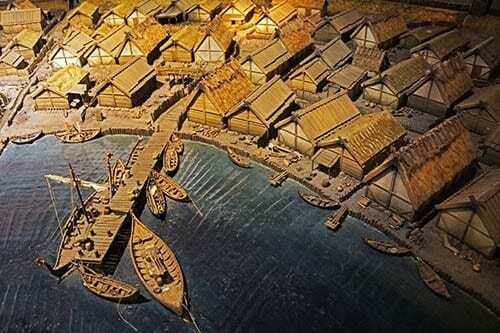 A model in the exhibit that was made by SVT Swedish Television is a miniature of how a Viking age town in Birka at Bjorko Island probably looked around 800 AD, including Viking ships moored in the harbor. Viking weapons on display at the National Museum of Denmark. Featuring an overview of Danish history from pre-historic times, the highlight of the fascinating National Museum of Denmark in Copenhagen are the Viking displays with their sagas of fierce battles fought by the ruthless ocean warriors and the warships that were the homes of up to 60 Norsemen during months at sea. In addition to a display of early artifacts, there are several books in the museum shop that cover Viking life extensively, including a book on Viking cooking. 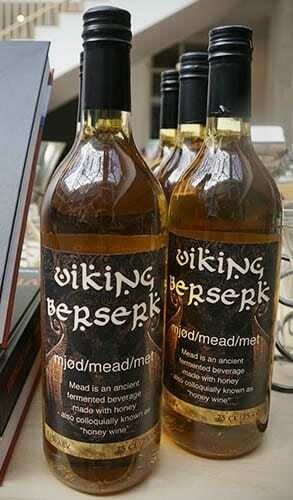 The shop also stocks Viking Berserk, a fermented honey wine known as mead. Located between Copenhagen’s City Hall and Parliament, the museum features recently renovated and easily understood displays, and best of all admission is free, although the mead is not. Viking mead for sale in the National Museum of Denmark’s museum shop. Another museum near Copenhagen, a half an hour away by train in Roskilde, offers an even more visceral Viking historical experience. Five original Viking ships can be examined there. Located by a fjord, the Viking Ship Museum also offers a unique opportunity for you to sail in a ship. At the museum’s boatyard you can follow the construction of a long-shaped, shallow draft Viking ship, which ranged in size from small fishing boats to ferries, commercial trade ships, and the famous warships. All were made the same way as is demonstrated at the museum’s boat builder’s workshop. Here you can try out your skill at planing planks of oak to be nailed together using authentic Viking tools and traditional methods taught by the artisans. Beautiful wooden designs can be seen being carved into a ship that is available for your purchase, in case you’d like to have one shipped home. During the summer season the Viking Ship Museum has a long list of activities and exhibitions. Admission during summer months is 115 Danish Krones (about US$17) for adults.